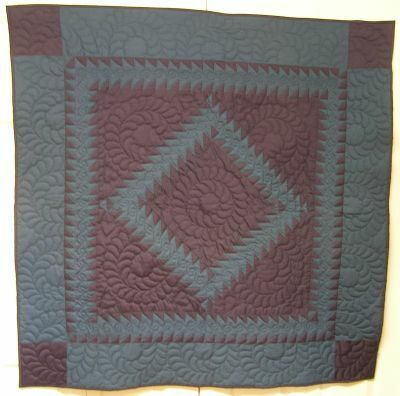 All of our quilts and wall hangings are Amish made and hand quilted. They are beautifully designed and examples of the quality and unique work of the Amish. 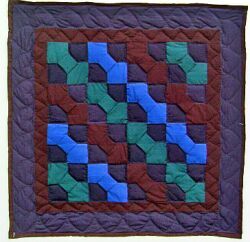 Many of the Amish quilts and wall hangings use black as an integral part of the design which represents the simplicity of their life, but, in the creative hands of these women, the resulting quilt is a vibrant and distinctive work of art. Along with the black based quilts, we have quite a few other patterns available. We hope that you will take the time to check out the selection of one of a kind Amish creations that Manchester Cottage has to offer - we are sure that they would be a wonderful compliment to any home. 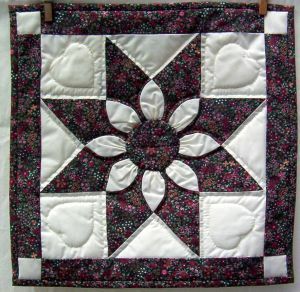 This large wall hanging has a unique variation on the center diamond design and features intricate quilting in the feather and heart patterns (click on photo to see this). It is done in a deep teal and purple fabric. It measures 48 x 48. This hand pieced and appliqued wall hanging is a wonderful example of the peacock pattern. 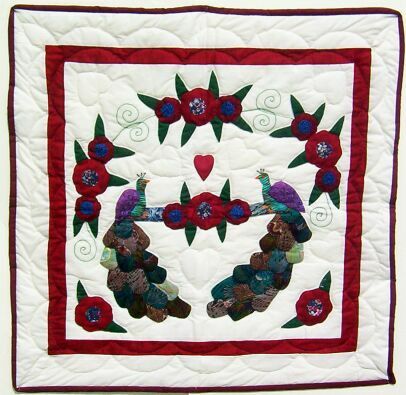 The beautiful combination of colors in the peacocks and flowers make them distinctive and the light background makes the quality and quantity of quilting obvious. This is a beautiful piece to own and display. It measures 36 x 36. This combination of plain Amish colors results in a beautiful trip around the world pattern. Although the fabrics themselves are not patterned, the placement of the pieces creates a wonderful patterned work of art. The simple colors are perfect backdrop for the beautiful quilting that is part of this piece. It measures 31 X 31. 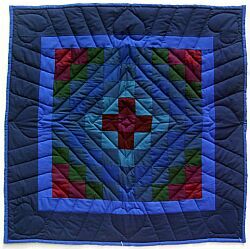 This Amish quillow is a wonderful cross between a pillow and quilt. The pillow is 18 x 18 and unfolds into a 45 x 60 quilt made of 2 layers of cotton with batting in between (click on photo to see quilt). The quilt matches the border of the pillow. 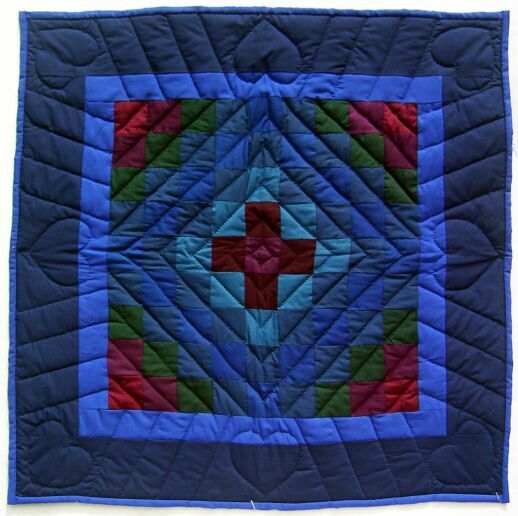 The pattern is spinning star done in blues and maroons and is a beautiful example of Amish craftmanship. 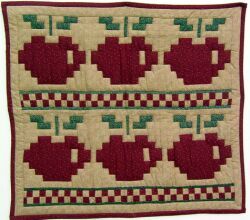 This quilt uses maroon and green to form apple shapes while the tan background sets off the apples and gives the wall hanging an antique feel. 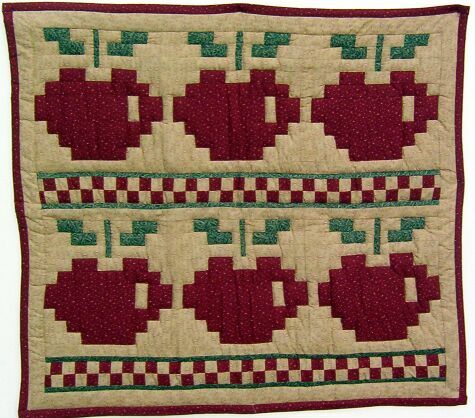 The checked patterns beneath the apples create a nice touch and the combination of all these parts makes this piece stand out as a beautiful quality quilt. It measures 30 X 33. 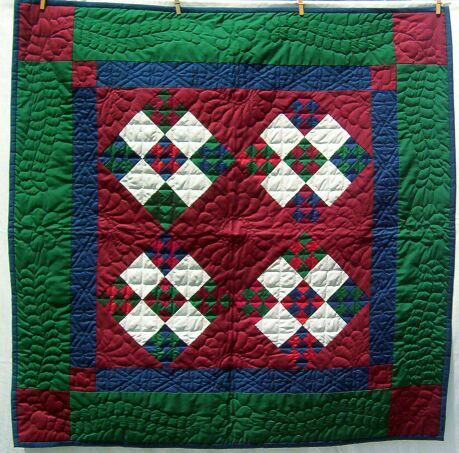 This wall hanging uses the typical plain Amish colors and puts them together using a nine patch pattern in various ways to produce a very interesting design. 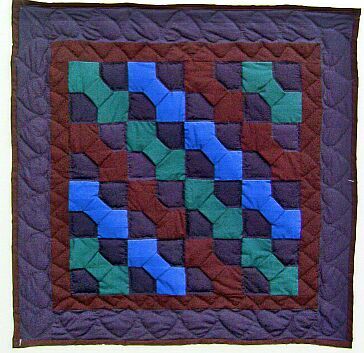 The intricate quilting is shown off well in the plain color areas and completes this quilt to produce a unique and quality piece. It measures 42 X 42. This large wall hanging has a distinctive combination of colors that really make the lone star design stand out. The rose and black fabrics form a beautiful eye catching piece. 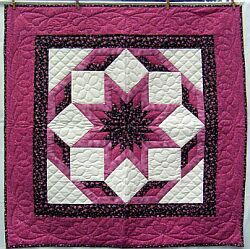 Various styles of quilting show off the lighter areas and complete this quilt with a high quality finish. It measures 41 x 41. This garden twist pattern is made with a variety of blue, cream, and white flowered fabrics along with a hint of lavender. 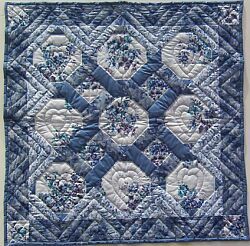 The design and delicate quilting compliment each other to produce a beautiful quality wall hanging. 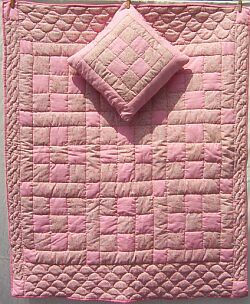 This wonderful crib quilt is made from a variety of pink fabrics and includs a matching pillow in the nine patch pattern. 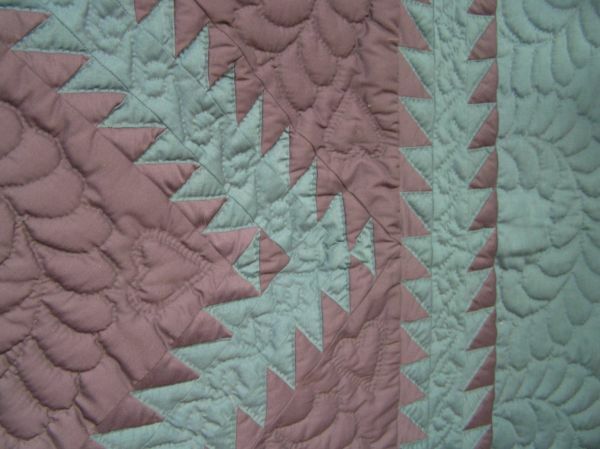 The quilting is set off by the pastel colors of the quilt. This piece would make a very special additon to any little girls' crib or room as a wall hanging. Our pink crib quilt measures 33 x 39. The complimentary pillow measures 12 x 12. These Amish colors are blended together in a bow tie pattern to produce a beautifully finished wall hanging. The quality hand quilting sets off the wonderful work on this piece and makes it a great display item. It measures 26 X 26. This small star wall hanging is a nice combination of colors. The star is done in a teal/rose/maroon flower pattern and solid maroon. 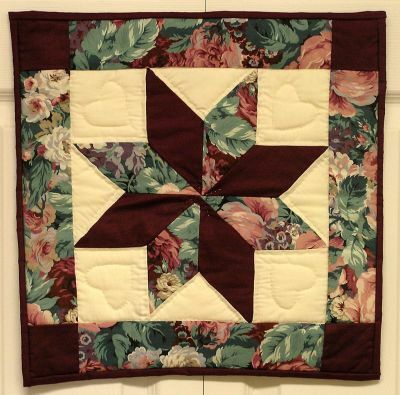 The outside is cream, maroon, and the flowered pattern with heart shaped and straight quilting. The back is cream but it has several spots on it which is why we have it marked down from $35.00 to $22.00. It measures 16 1/2 x 16 1/2. Although this is a smaller wall hanging, it is a very nice example of the dahlia pattern. It is done with green, rose, and maroon flowered fabric with cream inset panels, petals, and back. The heart shape quilting shows up well in the cream areas. It measures 15 x 15. This Amish made table runner is done in the dahlia style. 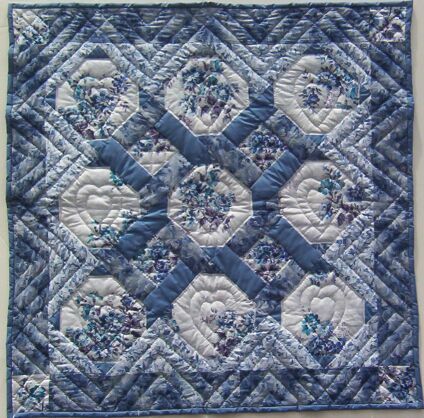 It is hand quilted and done in blues and creamy whites. The back is creamy white. It measures 45 x 17.